…so the brewery open-studio gig was this weekend and after attempting to go on the wrong weekend the actual show is, really, anti-climactic (see past post “Back to LACMA”). We both had our own projects at home which kept us in for the weekend except for the SWPL* double header: heading out to Carson for Ikea AND Target. We decided to mix it up with some retail entertainment. It’s such a treat to experience high ceilings and large spaces given our cramped living quarters. 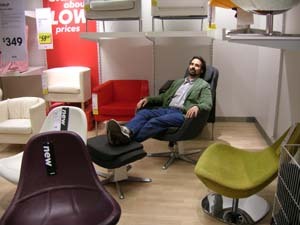 Ikea: I’m incensed – they’ve changed their generic Ikea-techno-elevator-house music loop to top-40-“commercial-tribal”. I hate it. I loved their techno-loop music along with the blue arrows on the floor directing my procession and the taped announcer over the PA while ascending by escalator: “welcome to IKEA…”. It was honest, transparent, and playfully modern; I could, with full awareness, accept my role as a willing consumer with these cues. I would very nearly believe that I could look up the music’s subliminal messages (i.e.”…get the swedish meatballs after you check out…”) on ‘lyrics.com’. It’s really losing its semiotic wit and Whoville edge (I even used their free post cards for greetings and casual thank you notes and they’re gone too!). 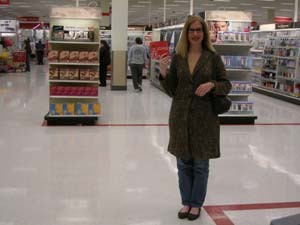 Target: Love the lighting there; just the right spread and footcandle bouncing off the white VCT floors – very flattering. No wonder everyone likes shopping there. 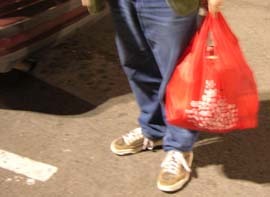 Also, received my free, nylon, Target bag with this month’s Vanity Fair magazine (in the mail for subscribers). Brought it. Used it. Very attractive graphic too.